Speaking of queens — and we were, weren’t we? I’m sure we were — it’s always struck me as a trifle peculiar that the largest country ruled by a queen calls itself the United Kingdom. It may have something to do with those mushy peas. 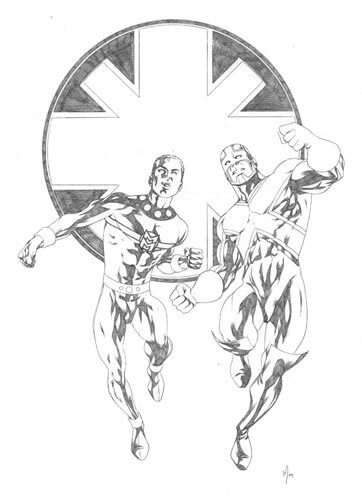 I’ve long wanted to commission a drawing for my Common Elements theme gallery that would feature the United QueenKingdom’s two greatest superheroes. It seemed somehow inappropriate, though, to assign the project to an artist who wasn’t a son or daughter of the Sceptered Isle. Somehow, I just didn’t think the Queen would approve. After lo, these many years, along came Mike McKone. Although best known on these formerly colonial shores for illustrating the adventures of such quintessentially American heroes as Spider-Man and the Fantastic Four, Mike leaped at the chance (or at the very least, politely agreed) to bring together for the first time two stalwart defenders of Albion: Marvelman and Captain Britain. Being the Yank that I am, I unthinkingly requested the commission from Mike using Marvelman’s American name — the character being known on this side of the Atlantic as Miracleman, for reasons that will become clear in a moment. Under his original nom de guerre, Marvelman has enjoyed a lengthy and storied career as a crimefighter, beginning in 1954. The idea for Marvelman was dreamed up by Len Miller, the British publisher who at the time was reprinting the adventures of the original Captain Marvel for UK audiences. When Fawcett, the good Captain’s American publisher, was driven from the comics field due to lawsuits filed by DC Comics, the publisher of Superman, Miller hired writer Mick Anglo to reinvent the character sufficiently to avoid similar legal action, thus enabling Miller to stay in business. Anglo’s revamped character was still a young news reporter who gained superpowers by uttering a magic word. Instead of Billy Batson’s “Shazam,” Micky Moran transformed by saying “Kimota,” or “atomic” spelled backwards phonetically. As Marvelman, Micky continued to wage war against evil until 1963. Twenty years later, legendary comics writer Alan Moore revived the character in new adventures. When American publisher Pacific Comics began reprinting the series, the hero’s name became Miracleman — a rather transparent effort to avoid incurring the wrath of a certain other comics concern already using the word “Marvel” to legally actionable effect. Part of the impetus for Marvelman’s return was the success of another superhero, ironically published by the UK arm of Marvel Comics. Captain Britain had been launched in 1976 as the Anglophilic equivalent of Marvel’s ever-popular Captain America. The new Captain appeared in his own eponymous comics, available only in the UK, for a couple of years before making his US debut in Marvel Team-Up #65. From that point forward, Captain Britain became a regular fixture in the Marvel Universe. In the 1980s, Cap’s cocreator, writer Chris Claremont, made him the linchpin of the X-Men spinoff series Excalibur, which featured a UK-based team of heroes including former X-Men Nightcrawler and Kitty Pryde. More recently, Cap has headlined his own title, Captain Britain and MI-13. I couldn’t be more thrilled that Mike McKone took a few moments away from his busy Amazing Spider-Man schedule to draw today’s spotlight artwork. I understand that Mike was pretty pleased with the results himself. This entry was posted on May 15, 2009 at 7:22 pm and is filed under Comic Art Friday. You can subscribe via RSS 2.0 feed to this post's comments. You can comment below, or link to this permanent URL from your own site. If you ever want this baby inked ……I haven’t taken a shot at Mike since assisting/ ghosting for Mr. McKenna on Acclaim’s Magnus Robot Hunter.